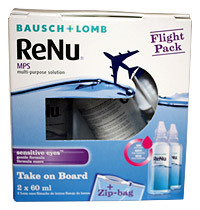 Renu Multi Purpose Solution Flight Pack for use with all soft lenses. The flight pack is a special `Aeroplane Friendly` pack size. Two 60ml bottles in a neat plastic zip lock bag giving you two weeks supply of solutions that meet the new regulations to keep in your hand baggage. Two 60ml bottles with two lens cases. A sterile solution containing boric acid, edetate, disodium, sodium borate, and sodium chloride. Be the first to write an online review of ReNu Multi-Purpose Solution Flight Pack and share your thoughts on this product with other shoppers!